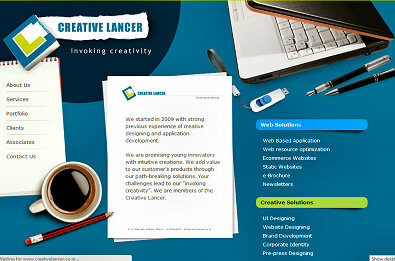 Creative Lancer a Kolkata based company specialized in best cutting edge corporate web solutions (web sites, portals, online shopping carts, ad banners, animated flash sites), eye catching audio visual corporate presentations, learning modules, animations and prints or graphics solutions. . . 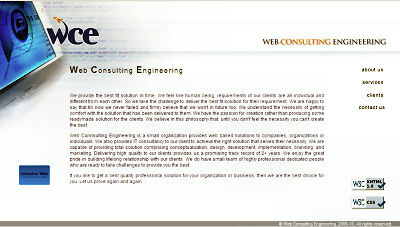 Web Connsulting Engineering is a small growing organization provides complete solution based on web media. Based on Kolkata (India) we are providing solutions at national and international level more than 2 years. We have professional expertise in web design, application development, branding and marketing. We are dedicated to provide high quality, requirement-oriented, cost-cutting and value-added solutions and services to our client. We believe in building the long lasting relationship with our clients. . .